This name uses Eastern Slavic naming customs; the patronymic is Mikhaylovna and the family name is Plisetskaya. Her early years were marked by political repression and loss. Her father Mikhail Plisetski, who was a Soviet official, was arrested in 1937 and executed in 1938, during the Great Purge. Her mother actress Rachel Messerer was arrested in 1938 and was imprisoned for a few years, then held in a concentration camp together with her infant son. Azari [ru] The older children were faced with the threat of being put in an orphanage but were cared for by maternal relatives. Maya was adopted by their aunt Sulamith Messerer, and Alexander was taken by their uncle Asaf Messerer; both of these were principal dancers of the Bolshoi. Plisetskaya studied ballet at The Bolshoi Ballet School from age nine, and she first performed at the Bolshoi Theatre when she was eleven. She studied ballet under the direction of Elizaveta Gerdt and also her aunt, Sulamith Messerer. Graduating in 1943 at the age of eighteen, she joined the Bolshoi Ballet company, quickly rising to become their leading soloist. In 1959 during the Thaw Time, she started to tour outside the country with the Bolshoi, then on her own. Her fame as a national ballerina was used to project the Soviet Union's achievements during the Cold War. Premier Nikita Khrushchev considered her to be "not only the best ballerina in the Soviet Union, but the best in the world." As an artist Plisetskaya had an inexhaustible interest in new roles and dance styles, and she liked to experiment on stage. As a member of the Bolshoi until 1990, she had international exposure and her skills as a dancer changed the world of ballet. She set a higher standard for ballerinas, both in terms of technical brilliance and dramatic presence. As a soloist, Plisetskaya created a number of leading roles, including Juliet in Lavrovsky’s Romeo and Juliet; Phrygia in Yakobson’s Spartacus (1958); in Grigorovich’s ballets : Mistress of the Copper Mountain in The Stone Flower (1959); Aurora in The Sleeping Beauty (1963); Mahmene Banu in The Legend of Love [ru] (1965); Alberto Alonso’s Carmen Suite (1967), written especially for her; and Maurice Bejart’s Isadora (1976). Among her most acclaimed roles were Kitri in Don Quixote, Odette-Odile in Swan Lake and The Dying Swan, first danced as a pre-graduate student under the guidance of Sulamith Messerer. A fellow dancer said that her dramatic portrayal of Carmen, reportedly her favorite role, "helped confirm her as a legend, and the ballet soon took its place as a landmark in the Bolshoi repertoire." Her husband, composer Rodion Shchedrin, wrote the scores to a number of her ballets. Having become “an international superstar” and a continuous “box office hit throughout the world,” Plisetskaya was treated by the Soviet Union as a favored cultural emissary. Although she toured extensively during the same years that other prominent dancers defected, including Rudolf Nureyev, Natalia Makarova, and Mikhail Baryshnikov, Plisetskaya always refused to defect. In 1991 she published her autobiography, I, Maya Plisetskaya. Plisetskaya was born on 20 November 1925, in Moscow, into a prominent family of Lithuanian Jewish descent, most of whom were involved in the theater or film. Her mother, Rachel Messerer-Plisetskaya, was a silent-film actress. Dancer Asaf Messerer was a maternal uncle and Bolshoi ballerina Sulamith Messerer was a maternal aunt. Her father, Mikhail Plisetski (Misha), was a diplomat, engineer and mine director; he was not involved in the arts, although he was a fan of ballet. Her brother Alexander Plisetski became a famous choreographer, and her niece Anna Plisetskaya would also become a ballerina. In 1938, her father was arrested and later executed during the Stalinist purges, during which tens of thousands of people were murdered. According to ballet scholar Jennifer Homans, her father was a committed Communist, and had earlier been "proclaimed a national hero for his work on behalf of the Soviet coal industry." Soviet leader Vyacheslav Molotov presented him with one of the Soviet Union's first manufactured cars. Her mother was arrested soon after and sent to a labor camp (Gulag) in Kazakhstan for the next three years. Maya and her seven-month-old baby brother were taken in by their maternal aunt, ballerina Sulamith Messerer, until their mother was released in 1941. During the years without her parents, while barely a teenager, Plisetskaya "faced terror, war, and dislocation," writes Homans. As a result, “Maya took refuge in ballet and the Bolshoi Theater.” As her father was stationed at Spitzbergen to supervise the coalmines in Barentsburg, she stayed there for four years with her family, from 1932 to 1936. She next studied under the great ballerina of the Bolshoi imperial school, Elizaveta Gerdt. She first performed at the Bolshoi Theatre when she was eleven. In 1943, at the age of eighteen, Plisetskaya graduated from the choreographic school. She joined the Bolshoi Ballet, where she performed until 1990. From the beginning, Plisetskaya was a different kind of ballerina. She spent a very short time in the corps de ballet after graduation and was quickly named a soloist. Her bright red hair and striking looks made her a glamorous figure on and off the stage. “She was a remarkably fluid dancer but also a very powerful one”, according to The Oxford Dictionary of Dance. “The robust theatricality and passion she brought to her roles made her an ideal Soviet ballerina.” Her interpretation of The Dying Swan, a short showcase piece made famous by Anna Pavlova, became her calling card. Plisetskaya was known for the height of her jumps, her extremely flexible back, the technical strength of her dancing, and her charisma. She excelled both in adagio and allegro, which is very unusual in dancers. Despite her acclaim, Plisetskaya was not treated well by the Bolshoi management. She was Jewish at a time of Soviet anti-Zionist campaigns combined with other oppression of suspected dissidents. Her family had been purged during the Stalinist era, and she had a defiant personality. As a result, Plisetskaya was not allowed to tour outside the country for sixteen years after she had become a member of the Bolshoi. The Soviet Union used the artistry of such dancers as Plisetskaya to project its achievements during the Cold War period with United States. Historian Christina Ezrahi notes, “In a quest for cultural legitimacy, the Soviet ballet was shown off to foreign leaders and nations.” Plisetskaya recalls that foreigners "were all taken to the ballet. And almost always, Swan Lake ... Khrushchev was always with the high guests in the loge,” including Mao Zedong and Stalin. Ezrahi writes, “the intrinsic paranoia of the Soviet regime made it ban Plisetskaya, one of the most celebrated dancers, from the Bolshoi Ballet’s first major international tour,” as she was considered “politically suspect” and was “non-exportable.” In 1948 the Zhdanov Doctrine took effect, and with her family history, and being Jewish, she became a "natural target . . . publicly humiliated and excoriated for not attending political meetings." As a result, dancing roles were continually denied her and for sixteen years she could tour only within the Soviet bloc. She became a "provincial artist, consigned to grimy, unrewarding bus tours, exclusively for local consumption”, writes Homans. We can feel the steely contempt and defiance taking hold of her dancing. When the curtain came down on the first act, the crowd exploded. KGB toughs muffled the audience’s applauding hands and dragged people out of the theater kicking, screaming, and scratching. By the end of the evening the government thugs had retreated, unable (or unwilling) to contain the public enthusiasm. Plisetskaya had won. 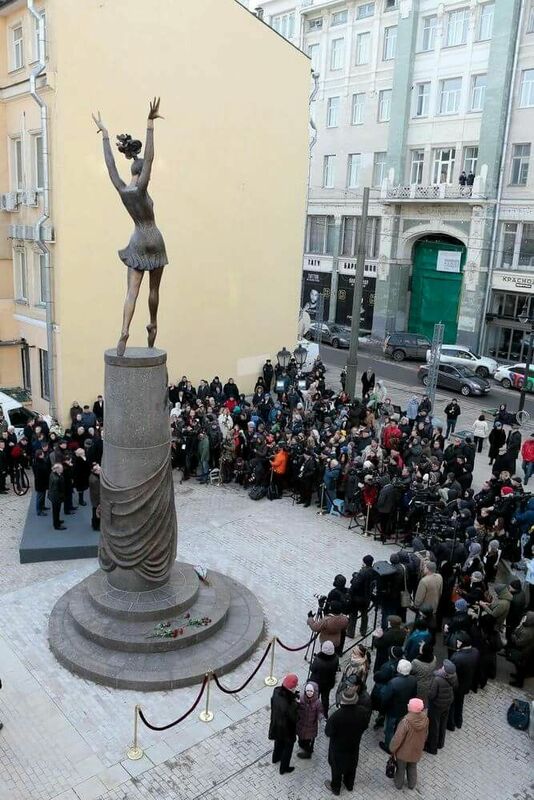 "Plisetskaya was not only the best ballerina in the Soviet Union, but the best in the world." Although she lacked the first-rate training and coaching of her contemporaries, Plisetskaya "compensated" by "developing an individual, iconoclastic style that capitalized on her electrifying stage presence", writes historian Tim Scholl. She had a "daring rarely seen on ballet stages today, and a jump of almost masculine power." Critic and dance historian Vadim Gaevsky said of her influence on ballet that "she began by creating her own style and ended up creating her own theater." Among her most notable performances was a 1975 free-form dance, in a modern style, set to Ravel’s Boléro. In it, she dances a solo piece on an elevated round stage, surrounded and accompanied by 40 male dancers. One reviewer wrote, "Words cannot compare to the majesty and raw beauty of Plisetskaya's performance:"
What makes the piece so compelling is that although Plisetskaya may be accompanied by dozens of other dancers mirroring her movement, the first and only focus is on the prima ballerina herself. Her continual rocking and swaying at certain points, rhythmically timed to the syncopation of the orchestra, create a mesmerizing effect that demonstrated an absolute control over every nuance of her body, from the smallest toe to her fingertips, to the top of her head. "She burst like a flame on the American scene in 1959. Instantly she became a darling to the public and a miracle to the critics. She was compared to Maria Callas, Theda Bara and Greta Garbo." She created a number of leading roles, including ones in Lavrovsky's Stone Flower (1954), Moiseyev's Spartacus (1958), Grigorovich’s Moscow version of The Stone Flower (1959), Aurora in Grigorovich's staging The Sleeping Beauty (1963), Grigorovich's Moscow version of The Legend of Love (1965), the title role in Alberto Alonso's Carmen Suite (1967), Petit's La Rose malade (Paris, 1973), Bejart's Isadora (Monte Carlo, 1976) and his Moscow staging of Leda (1979), Granero's Maria Estuardo (Madrid, 1988), and Lopez's El Renedero (Buenos Aires, 1990). After performing in Spartacus during her 1959 U.S. debut tour, Life magazine, in its issue featuring the Bolshoi, rated her second only to Galina Ulanova. Spartacus became a significant ballet for the Bolshoi, with one critic describing their "rage to perform", personified by Plisetskaya as ballerina, "that defined the Bolshoi." During her travels she also appeared as guest artist with the Paris Opera Ballet, Ballet National de Marseilles, and Ballet of the 20th Century in Brussels. By 1962, following Ulanova's retirement, Plisetskaya embarked on another three-month world tour. As a performer, notes Homans, she "excelled in the hard-edged, technically demanding roles that Ulanova eschewed, including Raymonda, the black swan in Swan Lake, and Kitri in Don Quixote." In her performances, Plisetskaya was "unpretentious, refreshing, direct. She did not hold back." Ulanova added that Plisetskaya's "artistic temperament, bubbling optimism of youth reveal themselves in this ballet with full force." World-famous impresario Sol Hurok said that Plisetskaya was the only ballerina after Pavlova who gave him "a shock of electricity" when she came on stage. Rudolf Nureyev watched her debut as Kitri in Don Quixote and told her afterwards, "I sobbed from happiness. You set the stage on fire." At the conclusion of one performance at the Metropolitan Opera, she received a half-hour ovation. Choreographer Jerome Robbins, who had just finished the Broadway play, West Side Story, told her that he "wanted to create a ballet especially for her." Plisetskaya's most acclaimed roles included Odette-Odile in Swan Lake (1947) and Aurora in Sleeping Beauty (1961). Her dancing partner in Swan Lake states that for twenty years, he and Plisetskaya shared the world stage with that ballet, with her performance consistently producing "the most powerful impression on the audience." Equally notable were her ballets as The Dying Swan. Critic Walter Terry described one performance: "What she did was to discard her own identity as a ballerina and even as a human and to assume the characteristics of a magical creature. The audience became hysterical, and she had to perform an encore." She danced that particular ballet until her late 60s, giving one of her last performances of it in the Philippines, where similarly, the applause wouldn't stop until she came out and performed an encore. Novelist Truman Capote remembered a similar performance in Moscow, seeing "grown men crying in the aisles and worshiping girls holding crumpled bouquets for her." He saw her as "a white spectre leaping in smooth rainbow arcs", with "a royal head". She said of her style that "the secret of the ballerina is to make the audience say, 'Yes, I believe.'" Fashion designers Yves Saint Laurent and Pierre Cardin considered Plisetskaya one of their inspirations, with Cardin alone having traveled to Moscow over 30 times just to see Plisetskaya perform. She credits Cardin's costume designs for the success and recognition she received for her ballets of Anna Karenina, The Seagull, and Lady with the Dog. She recalls his reaction when she initially suggested he design one of her costumes: "Cardin's eyes lit up like batteries. As if an electrical current passed through them. ":170 Within a week he had created a design for Anna Karenina, and over the course of her career he created ten different costumes for just Karenina. “She was, and still is, a star, ballet's monstre sacré, the final statement about theatrical glamour, a flaring, flaming beacon in a world of dimly twinkling talents, a beauty in the world of prettiness”. In 1967, she performed as Carmen in the Carmen Suite, choreographed specifically for her by Cuban choreographer Alberto Alonso. The music was re-scored from Bizet’s original by her husband, Rodion Shchedrin, and its themes were re-worked into a "modernist and almost abstract narrative." Dancer Olympia Dowd, who performed alongside her, writes that Plisetskaya’s dramatic portrayal of Carmen, her favorite role, made her a legend, and soon became a "landmark" in the Bolshoi's repertoire. Her Carmen, however, at first "rattled the Soviet establishment," which was "shaken with her Latin sensuality." She was aware that her dance style was radical and new, saying that "every gesture, every look, every movement had meaning, was different from all other ballets... The Soviet Union was not ready for this sort of choreography. It was war, they accused me of betraying classical dance." Some critics outside of Russia saw her departure from classical styles as necessary to the Bolshoi's success in the West. New York Times critic Anna Kisselgoff observed, "Without her presence, their poverty of movement invention would make them untenable in performance. It is a tragedy of Soviet ballet that a dancer of her singular genius was never extended creatively.” A Russian news commentator wrote, she "was never afraid to bring ardor and vehemence onto the stage," contributing to her becoming a "true queen of the Bolshoi." Her life and work was described by the French ballet critic André Philippe Hersin as "genius, audacity and avant-garde." After Galina Ulanova left the stage in 1960, Maya Plisetskaya was proclaimed the prima ballerina assoluta of the Bolshoi Theatre. In 1971, her husband Shchedrin wrote a ballet on the same subject, where she would play the leading role. Anna Karenina was also her first attempt at choreography. Other choreographers who created ballets for her include Yury Grigorovich, Roland Petit, Alberto Alonso, and Maurice Béjart with "Isadora". She created The Seagull and Lady with a Lapdog. She starred in the 1961 film, The Humpbacked Horse, and appeared as a straight actress in several films, including the Soviet version of Anna Karenina (1968). Her own ballet of the same name was filmed in 1974. While on tour in the United States in 1987, Plisetskaya gave master classes at the David Howard Dance Center. A review in New York magazine noted that although she was 61 when giving the classes, “she displayed the suppleness and power of a performer in her physical prime.” In October that year she performed with Rudolf Nureyev and Mikhail Baryshnikov for the opening night of the season with the Martha Graham Dance Company in New York. Plisetskaya's husband, composer Rodion Shchedrin, wrote the score to a number of her ballets, including Anna Karenina, The Sea Gull, Carmen, and Lady with a Small Dog. In the 1980s, he was considered the successor to Shostakovich, and became the Soviet Union's leading composer. Plisetskaya and Shchedrin spent time abroad, where she worked as the artistic director of the Rome Opera Ballet in 1984–85, then the Spanish National Ballet of Madrid from 1987 to 1989. She retired as a soloist for the Bolshoi at age 65, and on her 70th birthday, she debuted in Maurice Béjart's piece choreographed for her, "Ave Maya". Since 1994, she has presided over the annual international ballet competitions, called Maya. And in 1996 she was named President of the Imperial Russian Ballet. She was ballet director of the Rome Opera (1983–84), and artistic director of Ballet del Teatro Lirico Nacional in Madrid (1987–90). Beginning in 1994, she presided over the annual international ballet competition in Saint Petersburg, called Maya. In 1996 she was named the President of the Imperial Russian Ballet, Moscow private dance company. She was awarded the Prince of Asturias Award for the Arts in 2005 with the ballerina Tamara Rojo also. She was awarded the Spanish Gold Medal of Fine Art. In 1996 she danced the Dying Swan, her signature role, at a gala in her honor in St. Petersburg. She was, and still is, a star, ballet's monstre sacre, the final statement about theatrical glamour, a flaring, flaming beacon in a world of dimly twinkling talents, a beauty in the world of prettiness." In 2006, Emperor Akihito of Japan presented her with the Praemium Imperiale, informally considered a Nobel Prize for Art. Plisetskaya died in Munich, Germany, on 2 May 2015 from a heart attack. Plisetskaya was survived by her husband, and a brother, former dancer Azari Plisetsky, a teacher of choreography at the Béjart Ballet in Lausanne, Switzerland. According to her last will and testament, she was to be cremated, and after the death of her widower, Rodion Shchedrin, who is also to be cremated, their ashes are to be combined and spread over Russia. The passing of great Maya Mikhailovna [Plisetskaya] whose creative work embodied the whole cultural era is an irretrievable loss for Russian and world art. Her brilliant choreography and wonderful grace, fantastic power of dramatic identification and outstanding mastery dazzled the audience. Thanks to her selfless service to art and commitment to the stage, she was respected all over the world. Brazilian mural artist Eduardo Kobra painted a 40-foot tall mural of Plisetskaya in 2013, located in Moscow's central theater district, near the Bolshoi Theatre. Conductor and artistic director Valery Gergiev, who was a close friend of Plisetskya, gave a concert in Moscow on November 18, 2015, dedicated to her memory. In St.Petersburg, the Mariinsky Theater Symphony Orchestra paid homage to Plisetskaya’s memory with a concert on December 27, 2015. It was conducted by Valery Gergiev and included a performance with ballet dancer Diana Vishneva. The Mariinsky Ballet later performed a four-program "Tribute of Maya Plisetskaya" at the Brooklyn Academy of Music in February 2016. The Bolshoi Theater performed a concert in memory of Plisetskaya at the London Coliseum on March 6, 2016. In choosing Carmen, Mitroshin emphasized not only Plisetskaya’s physical prowess, grace and beauty, he put a big exclamation point after character... Look at those gorgeous arms, hands, legs. Look at the sassy sway of the dress. Look at the dark, hard eyes and the tight, determined mouth. Look at the sway of the back. Look at that crazy flower on her head. Look at how all of it strains upward into the sky. I’m telling you, the whole thing is beautiful. Plisetskaya's tour manager, Maxim Gershunoff, who also helped promote the Soviet/American Cultural Exchange Program, describes her as "not only a great artist, but also very realistic and earthy ... with a very open and honest outlook on life." Actress Shirley MacLaine once held a party for her and the other members of the Bolshoi. She remembered seeing her perform in Argentina when Plisetskaya was sixty-five, and writes "how humiliating it was that Plisetskaya had to dance on a vaudeville stage in South America to make ends meet." Dancer Daniel Nagrin noted that she was a dancer who "went on to perform to the joy of audiences everywhere while simultaneously defying the myth of early retirement." MacLaine's brother, actor Warren Beatty, is said to have been inspired by their friendship, which led him to write and produce his 1981 film Reds, about the Russian Revolution. He directed the film and costarred with Diane Keaton. He first met Plisetskaya at a reception in Beverly Hills, and, notes Beatty's biographer Peter Biskind, "he was smitten" by her "classic dancer's" beauty. Plisetskaya became friends with film star Natalie Wood and her sister, actress Lana Wood. Wood, whose parents immigrated from Russia, greatly admired Plisetskaya, and once had an expensive custom wig made for her to use in the Spartacus ballet. They enjoyed socializing together on Wood's yacht. Plisetskaya receives a governmental award from President of Russia Vladimir Putin on 20 November 2000. ^ Maya Plisetskaya profilke, viola.bz; accessed 2 May 2015. ^ Plisetskaya and Shchedrin settle in Lithuania, upi.com; accessed 4 May 2015. ^ Two greats of world ballet win Spanish Nobels, expatica.com; accessed 4 May 2015. ^ Current Biography Yearbook, H. W. Wilson Co., 1964, p. 331. ^ a b Miller, Jack (1984). Jews in Soviet Culture. Transaction Publishers. p. 15. ISBN 0-87855-495-5. ^ Popovich, Irina. "Maya Plisetskaya: A Balletic Lethal Weapon" Archived 11 October 2008 at the Wayback Machine, The Russia Journal, Issue 10, May 1999. ^ a b Eaton, Katherine Bliss (2004). Daily Life in the Soviet Union. Greenwood Publishing Group. ISBN 0-313-31628-7. ^ a b c d e f g h i j k l m n Plisetskaya, Maya (2001). I, Maya Plisetskaya. Yale University Press. ISBN 0-300-08857-4. ^ Taubman, William; Khrushchev, Sergei; Gleason, Abbott; Gehrenbeck, David; Kane, Eileen; Bashenko, Alla (2000). Nikita Khrushchev. Yale University Press. ISBN 0-300-07635-5. ^ a b c d "Maya Plisetskaya, Ballerina Who Embodied Bolshoi, Dies at 89", New York Times, 2 May 2015. ^ a b "Master Class: Maya Plisetskaya's Bolero", Artful Intel, 25 October 2011. ^ Life magazine, 23 February 1959. ^ a b "Moscow Honors Bolshoi's 'True Queen'", Washington Post, 20 November 2005. ^ Tolstoy, Leo (2003). Anna Karenina. Mandelker, Amy; Garnett, Constance. Spark Educational Publishing. ISBN 1-59308-027-1. ^ a b Sleeman, Elizabeth (2001). The International Who's Who of Women (3rd ed.). Routledge. ISBN 1-85743-122-7. ^ Crisp, Clement (18 November 2005). "Mayan goddess". Financial Times. Retrieved 25 June 2008. ^ Скончалась балерина Майя Плисецкая (in Russian). ITAR TASS. 2 May 2015. Retrieved 2 May 2015. Wikimedia Commons has media related to Maya Plisetskaya. "Maya Plisetskaya Dances Ballet, biographical documentary, 1964" on YouTube, 1 hr. 11 min. "Legendary performances: Maya Plisetskaya" on YouTube, documentary biography, 1 hr. 20 min. "Maya Plisetskaya in 'Swan Lake' on YouTube, 3 1/2 min. "Maya Plisetskaya in 'Spartacus'" on YouTube, 2 1/2 min. "Maya Plisetskaya - Bolero, by Ravel", video, 20 min.